A pastor’s life is uniquely difficult. 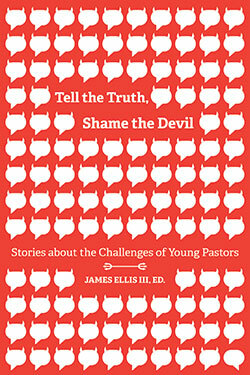 Tell the Truth, Shame the Devil, then, is an attempt to expose some of the challenges that young clergy often face. While not exhaustive, this collection of essays is a superbly compelling and diverse introduction to how tough being a pastor under the age of thirty-five can be. Pastors belonging to a wide swath of Christian traditions share their stories here: Episcopal, Baptist, United Methodist, Assemblies of God, Lutheran, United Church of Christ, Church of the Brethren, Christian Church (Disciples of Christ), Foursquare. These humble servants of our souls give clergy and congregation much to learn through their real-life vocational testimonies. James Ellis III is an ordained Baptist pastor and writer based in the District of Columbia. Presently pursuing the Doctor of Ministry degree at Asbury Theological Seminary, he is a graduate of Pittsburgh Theological Seminary, George W. Truett Theological Seminary at Baylor University, and the University of Maryland. He and his wife love bowling together even though they aren’t good at it.